Is Saturn losing its rings? The sixth planet from the sun, Saturn, is perhaps best known for its many rings, which consist of billions of particles of ice and rock. But throughout the next several months, if you look at Saturn with a telescope, you’ll see something strange – the rings seem to be disappearing. The Hubble Space Telescope took this image of Saturn, seen titled edge-on, in 1995. That’s because about every 14 to 15 years, the tilt of the planet is such that we on Earth see the rings edge-on. In reality the rings are still there, but they appear nearly invisible from Earth. The phenomenon, which stumped Galileo in the 1600s, is called a “ring plane crossing.” While the Earth has an equinox every six months, Saturn's are more spaced out - in fact, it orbits the sun once every 29.5 years. The rings will appear thinner and thinner until September 4, 2009, when they will seem to have vanished. On that day, we will see the sun and Saturn only 11 degrees apart in the sky, says Linda Spilker at NASA, deputy project scientist and co-investigator on the Cassini Mission to Saturn. But beware – Saturn will be in the daytime sky, making it difficult to see so close to the sun. Unlike a solar eclipse, the Saturn-with-thin-rings phenomenon will be visible from essentially the whole Earth, because it is so far away, Spilker says. But it will be difficult to actually see this around the exact time of the ring plane crossing in September. The bottom line is that, while the actual ring crossing doesn’t happen until the fall, if you want to see Saturn appear to have thin rings, act fast! 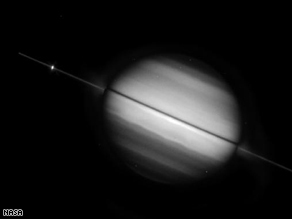 According to the Sky and Telescope star-gazing guide for this week, Saturn’s rings are only 0.8° or 0.9° from edge-on. The planet rises around 10 p.m.
Read more about the ring crossing from NASA. 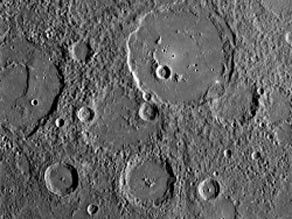 Here are the first images from the MESSENGER spacecraft's Monday flyby of Mercury. MESSENGER will fly by the planet once more in September 2009. The spacecraft is scheduled to enter orbit around Mercury on March 18, 2011. In the meantime, the Cassini spacecraft is getting ready to execute two more flybys of Saturn's moon Enceladus (pronounced in-SELL-uh-dus) this month. Enceladus, you may recall, is the moon that is spewing cold geysers of water into space, which suggests to scientists there is liquid water (possibly even an ocean) under its surface. The first flyby, set for Thursday October 9th, is arguably the more exciting of the two. Cassini will pass just 16 miles over the surface of the moon, directly through the geyser plume. The emphasis on this flyby will be to use the on-board science instruments to learn more about its composition. Data from previous flybys indicate that, in addition to water vapor, water ice, and dust, the plume also contains trace amounts of organic chemicals. The presence of organics has certainly perked up the antennae of the astrobiology community. In only a short period of time this little moon has shot to near the top of the list of promising places to look for extra-terrestrial microbial life. The second Enceladus flyby of the month is set for Oct. 31. Cassini will fly 122 miles over the surface, and use on-board cameras to photograph surface fractures in the south polar region. That's what Cassini spacecraft scientists had to say about what's in those cold water geysers shooting off from the pole of Saturn's moon Enceladus (that's pronounced "in-SELL-uh-dus"). The Cassini team was stunned to discover the geysers two years ago when the probe made its first flyby of the tiny moon. Then on March 12th, they got another chance to point their science instruments at the billowing plume during another close approach, passing just 120 miles from the surface. This time the optical cameras took a back seat to a suite of spectrographs designed to "taste and smell" what chemicals are present. The team has just announced the initial science findings. It turns out the jets are mostly water vapor, with some ice crystals mixed in. Also present are methane, carbon dioxide, carbon monoxide, and an abundance of both simple and complex organic chemicals. Another instrument on board measured the temperatures at the fissures where the geysers erupt from the surface. Turns out it gets up to a hot and balmy -130 degrees Fahrenheit there. OK, that's pretty cold. But it is significantly warmer than the -300 degrees Fahrenheit temperatures elsewhere on that moon. The researchers say some sort of heat source deep within the planet must be at work, and that underground pockets of liquid water very likely exist - maybe even relatively close to the surface. So what does it all mean? The moon has water, organic compounds, and a heat source...and that makes it a prime hunting ground for astrobiologists (scientists who look for signs of extraterrestrial life). They don't know at this point if that underground liquid water exists, and they certainly don't know if any sort of microbial life form may be living there. But you can bet they're excited about it! 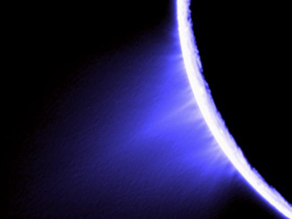 Cassini will flyby Enceladus again in August. NASA's Cassini spacecraft has made yet another stunning find during its tour of Saturn and its moons...evidence of an underground ocean of water and ammonia on Titan. Cassini image of Saturn’s A and F rings along with the tiny moon Epimetheus and the giant moon Titan. Source: NASA/JPL/Space Science Inst. The new data was gathered using Cassini's Synthetic Aperture Radar during 19 flybys of Titan since late 2005. The spacecraft's optical cameras don't work so well with Titan because the moon actually has a thick atmosphere and appears constantly shrouded in a smoggy haze. But the radar can penetrate through that, and scientists were able to map out the location of 50 "landmarks" like lakes, canyons and mountains. There is just one problem: the landmarks appear to be shifting around, sometimes by as much as 19 miles from their expected location. What could explain it? Writing in the journal Science, Cassini scientists say the most plausible answer is that the icy crust of the moon is moving around on top of an internal ocean. A decade ago, scientists working with the Galileo spacecraft on its mission to the Jupiter system concluded from magnetic field data that the moon Europa also harbors a salty ocean under its ice sheets. They think Europa's ocean could be as close as 4.7 miles to the surface. The Cassini folks think Titan's ocean is deeper down, 62 miles beneath the ice and ground. Of course, where there is water, astrobiologists will be interested in looking for life forms...so Titan almost certainly just bumped up a few notches in their estimation. Cassini deployed a probe called Huygens that actually landed on Titan back in 2005, sending back these remarkable pictures from the surface. Titan has long fascinated planetary scientists because of its high concentration of organic chemicals like methane and ethane. They say conditions there are similar in many ways to those on Earth billions of years ago, before life began here. 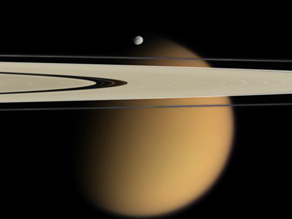 Study of Titan could better help researchers understand how the early Earth evolved.